Climate Bonds Initiative’s flagship ‘Bonds and Climate Change State of the Market 2018' report will be launched today at HSBC’s Finance for Global Change Forum, one of the first events to kick off Climate Week NYC. The State of the Market (SOTM) report provides an analysis of the labelled green bond climate-aligned and universe, highlighting investment opportunities to finance climate-aligned assets within the following climate themes: clean energy, low carbon transport, water management, low carbon buildings, waste management and sustainable land use. 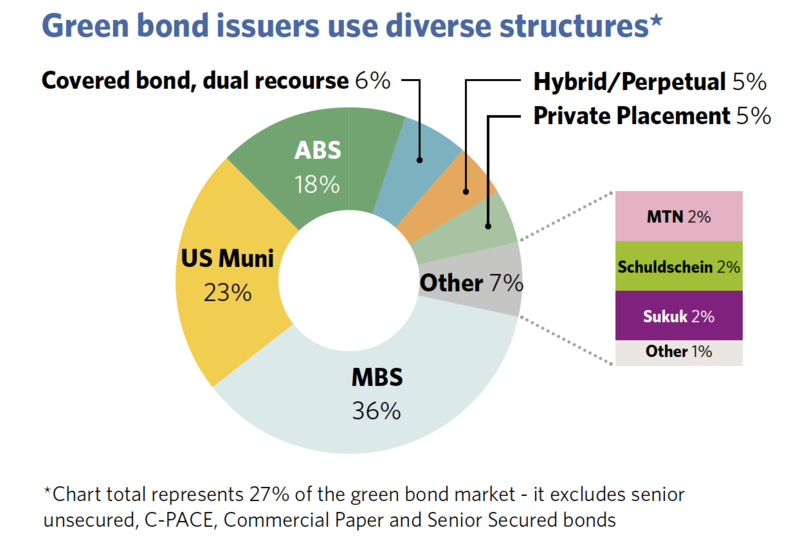 This year’s report also provides an in-depth analysis of the diverse bond structures that have been used in the green bond market, as well as an update on the latest policy developments. While previous SOTM reports focused on identifying fully-aligned issuers that derive >95% of revenues from ‘green’ business lines, this year we expanded the scope to include strongly-aligned issuers that derive 75-95% of revenue from green business lines. Separate research was conducted on fully-aligned US Muni agencies to identify their total outstanding unlabelled bonds. This year’s dataset includes climate-aligned and green bonds issued after 1st January 2005 and before 30th June 2018*. *more information on the research’s methodology can be found on page 2 of the report. The green bond label is and will remain an essential tool within the fixed income space for both investors and issuers. For issuers, it can provide much-needed finance for low carbon assets while also signalling sustainability aspirations and enabling access to a wider investor base. For investors, the label enables easy identification of green fixed income products as well as enhanced transparency of the projects being financed and their impact. 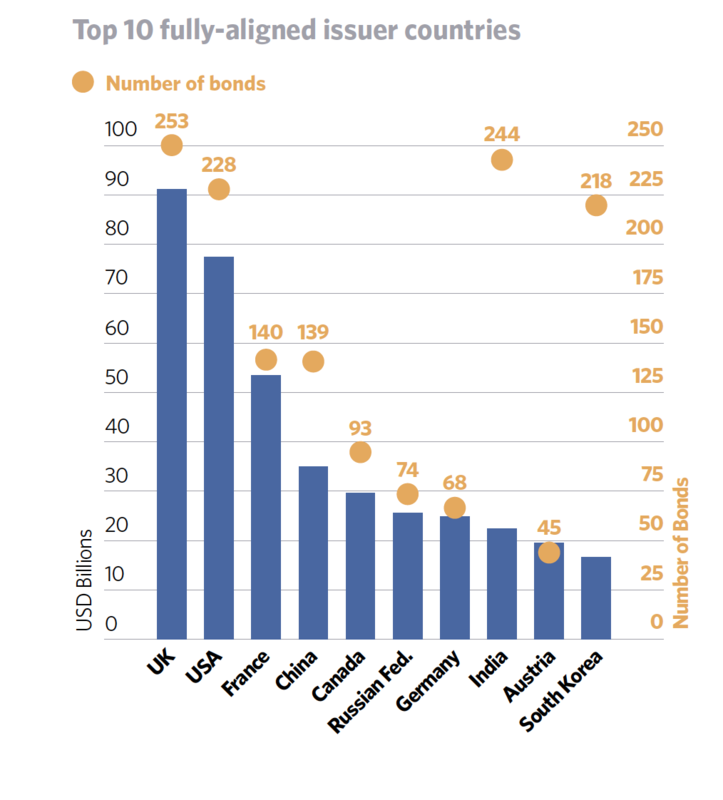 The universe of bonds from ‘pure-play’ issuers highlighted throughout this report indicates that there is huge potential for the growth of the labelled green bond market. The introduction of solar ABS and PACE ABS as new funding instruments designed specifically to refinance large pools of small green loans and leases initiated a green securitisation market, which has gained prominence with Fannie Mae Green MBS. 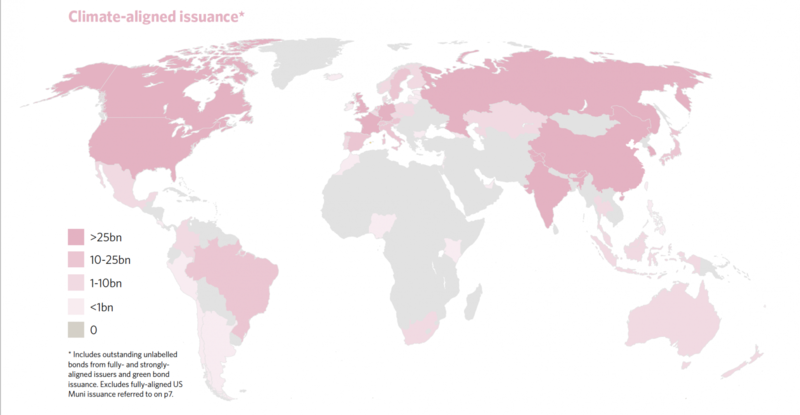 Private placements have accompanied public bond issuance since 2010 and have been instrumental in supporting the introduction of green bonds in emerging markets or to tap into foreign investors. 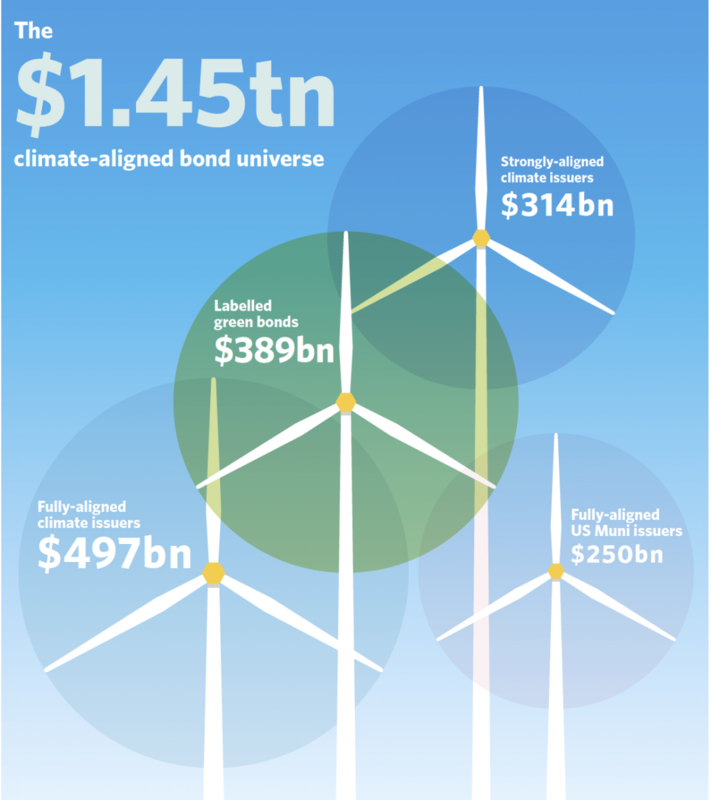 The report identifies a universe of USD1.45tn climate-aligned bonds, made up of USD389bn in green bonds. This points to a large universe of unlabelled bonds financing green infrastructure, implying a huge potential for a larger and even more diverse green bond market. However, there is still a long way to go. Global emissions remain on track to exceed 2 degrees of warming and USD90tn of investment in climate projects is needed by 2030. If we are to successfully combat climate change, global green finance needs to reach USD1tn by end 2020 and grow each year of the new decade.